Since buying a new vehicle can be expensive, it only makes sense to get exactly what you want or need in the long run. Few manufacturers make this easy. Jeep, on the other hand, has based its entire customer service philosophy on this very principle: provide the customer what they want and leave out the rest without wasting their time. If you want this type of car buying experience, it is time to come on down to Faricy today to find the Jeep of your dreams. Even though Jeep has long been recognized as one of the best off-roading manufacturers today, this company doesn’t just focus on off-road performance. In fact, most of the Jeep models are right at home virtually anywhere on or off the road. If you need something for the city, a Jeep vehicle is for you. If you have the need for something in the country, a Jeep vehicle can handle your demands. If there is something off-road you are wanting to visit, a Jeep vehicle has you covered. By taking a comprehensive approach, Jeep is able to meet the needs of virtually anyone looking for a new SUV today. Best of all, you don’t have to do a lot of research or test driving to find that perfect vehicle. With each model being capable of covering a lot of ground, it is difficult to go wrong with any Jeep model. Still, we know that finding the right SUV partly comes down to the specific performance, convenience, and safety features that model offers. Therefore, Faricy is on hand to help you find the differences between each model that matter to you. In other words, we can help you make the right decision when it feels like there are too many choices on the table. This is one area most people don’t think of when thinking of Jeep vehicles. Instead of picturing a Jeep Wrangler tackling muddy terrain, imagine it driving around in the city on the daily commute to work. Sounds far-fetched? Think again. In truth, many of the Jeep models are perfect for city environments. The Compass is a great city vehicle that balances a smaller SUV frame with a good amount of engine performance under the hood. For the stop-and-go traffic found in most city environments, this vehicle is perfect with its 32 MPG. When you want to take it out of the city, however, the Compass is more than capable of that as well. For a larger city vehicle, the Cherokee makes it easy to carry a large family in style. 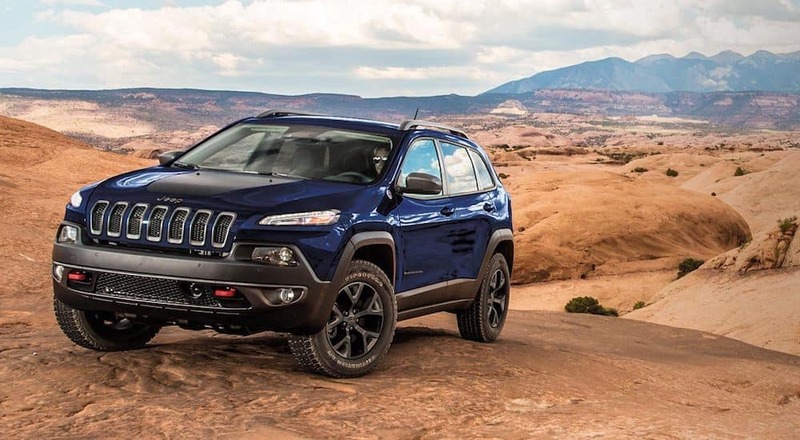 Carrying the same pedigree for off-roading, the Cherokee has a more powerful engine combined with a drivetrain that delivers great traction in challenging terrain. With its 2.0L Turbo, you can expect up to 31 miles per gallon. Long the domain of truck manufacturers, rural environments such as factories and farms provide a different set of challenges for vehicles. People who drive in these environments, especially while on the job, need a vehicle that can survive longer distances and the typical abuse of narrow dirt roads. To simply get around the winding country roads, something like the Renegade is perfect for the combination of hard and rough terrain. The small size of the Jeep is perfect for maneuvering around narrow roads, large farm equipment, or livestock. The interior has space for four or five people with some room left over for a few supplies or tools. It may be disguised as a family-friendly full-size SUV, but the Grand Cherokee also makes quiet the capable workhorse as well. Offering the most horsepower and towing capability, the Cherokee is right at home towing large equipment or a lot of supplies/tools in the spacious interior with rear folding seats. Best of all, you can choose between hauling a lot of people or cargo with the same truck-line platform. Then, when you need a break, take the Grand Cherokee off-road for a real adventure. This is the area where Jeep has excelled for decades. The first Jeep Wranglers were designed to survive the harsh, dangerous off-road environments of World War II. Since that time, most of the Jeep models have carried the same pedigree of off-road performance without sacrificing the on-road driving experience. For the ultimate off-road experience, the Jeep Wrangler is king. The amount of customization you get with this vehicle is unparalleled. Take off the doors, take out the windshield, add body plating and an electric winch, and anything else you need or want to have the perfect off-road vehicle. The Jeep Wrangler makes it possible. Other Jeep models also provide great off-road performance. All-wheel and four-wheel-drive options will give you all the traction you need for light to medium off-roading. Combined with the interior luxury and comfort that you get with larger SUVs, the off-road experience is unique. If you want a vehicle that can handle the challenges in an off-road environment while keeping you safe and comfortable inside, it’s time to start looking at Jeep. Colorado is the perfect example of a state with a diverse set of driving environments. You can go from the crowded traffic of Colorado Springs to backcountry roads in just a few minutes. Make a sharp turn, drive a few more minutes, and you may find yourself in the mountains where rocks and trees block your path. These are the types of environments that all Jeep vehicles are made for. Faricy is the premier Jeep dealership in the state of Colorado. If you think the Jeep has a model that will handle your particular set of needs and wants, Faricy is the place to check out. In combination with our great inventory of up-to-date Jeep models, we also provide unparalleled customer service to anyone who comes for a visit. Come visit us today to see how we can help you the next time you need a new SUV. We will give you all the information you need, provide test drives, and do what we can to make sure you have the best car purchasing experience possible. Contact us today.